Now that the kids are out of school, I have summer on the brain, and summer means lazy days and picnics. Unless your name is Peanut Head. Then you have to go to work and make money so your wife and kids can stay home and play. Sorry, Peanut Head. If it makes you feel any better, we'll save you some potato salad. Actually, I'm not a big fan of potato salad, but Peanut Head loves it so I have to know how to make it. Here are the ingredients: potatoes, mayonnaise, ground mustard, salt, pepper, celery, onion, pickle relish, hard-boiled eggs, and paprika. Which reminds me, someone asked me what I think of the Olive Oil mayonnaise. I hate it. I guess I should probably tell you that I hate mayonnaise, so you should never ask me what I think of mayonnaise. Peanut Head likes mayo though, and he thinks it's great, so there you have it. Potato Salad is super easy to make. And now you have a recipe card for it too. Enjoy! I always make it with miracle whip, not mayo, it just taste better, in my opinion. I'm marking this recipe and will hopefully remember I've done so and will come back to it. I LOVE potato salad! Now that it's summer I'm going to wish more and more that I can just stay home and play with my kids. But them's the breaks, if I didn't love my job so much I'd quit and do just that! 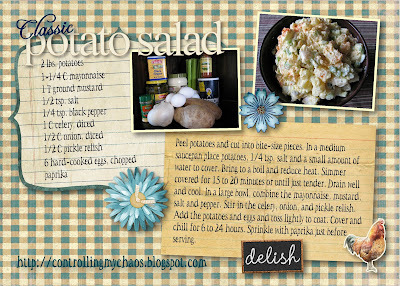 I love potato salad and you just gotta have it in the summer!! This recipe is a little different than mine and I will have to try it out! I bookmarked it so I can try it later this week. I love potato salad, too. Your recipe looks delicious. thanks for sharing it!